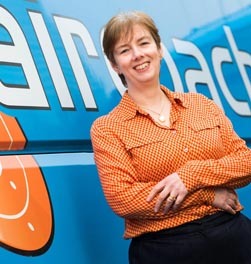 Aircoach, Ireland’s leading private bus and coach operator, have announced the appointment of Margaret Mughal as its new Finance Manager. Margaret brings a wealth of knowledge to the role as prior to joining Aircoach, she served as Financial Accountant for TAFC Manufacturing Ireland Ltd for the past three and a half years, and previously H J Heinz Frozen and Chilled Foods Ltd for 13 and a half years. Margaret holds FCCA qualifications, attended Dundalk Institute of Technology and holds a Diploma in international reporting standards. Aircoach provides a range of high frequency, quality scheduled coach services to and from Cork and Belfast cities to Dublin City Centre and Dublin Airport. It is the only bus company in Ireland providing 24 hour service.